Things started moving too fast for me in 1981, the same year I loosened my grip on the Cardboard Gods. I was 13. 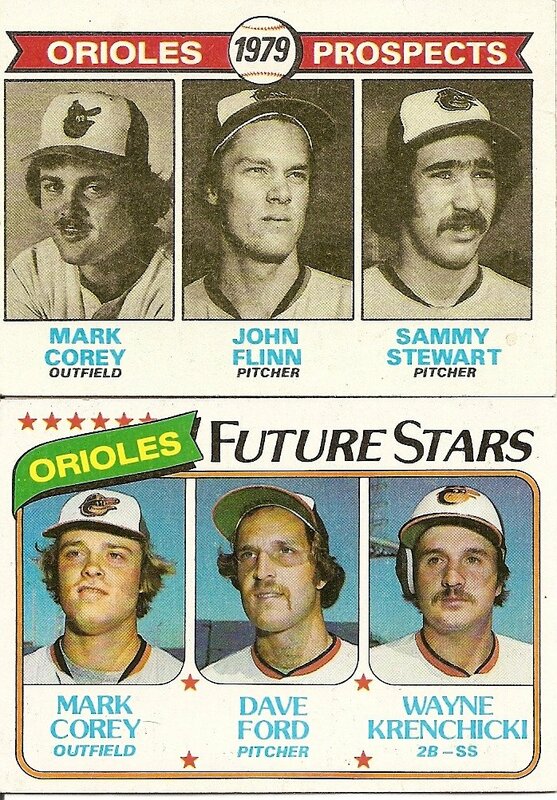 I bought a few packs of cards that year, no more, so I didn’t get the 1981 Orioles Future Stars card featuring Mike Boddicker, Floyd Rayford, and Mark Corey. It was the third year in a row in which Mark Corey appeared for Topps in a group portrait with other hopefuls. Had I seen the 1981 version of the card I might have wondered if Mark Corey had somehow found a way to make time stand still, to remain forever in a hypothetical world, the future always far off and golden. But even perpetual Future Star Mark Corey couldn’t find the stop button on this ride. We all are carried forward. In September of 1981 Corey got the last of his three brief tastes of the major leagues, going 0 for 8 and bringing his career batting average down to .211, perilously close to the Mendoza Line. Me, I entered ninth grade. One of my classes was biology, which included a mix of ninth and tenth graders. The ninth graders were supposed to be the smart kids, the ones able to skip the earth science class the rest of the ninth graders were taking and go straight to the hard stuff. But though I liked the teacher, a gentle bearded former hippie named Mr. Brukhardt, I found the work both uninteresting and baffling and started falling farther and farther behind. I sat in front of two Bubble Yum-popping tenth grade girls who said I looked funny because my feet were too big. The class, in my memory, is a blur of incomprehensible concepts and the guts of upturned pickled frogs. In the end I passed the class, but with the worst mark I’d yet received, that most leaden of grades, a D.
My mother suggested I take it again. By then it had been decided that I’d go away to boarding school in 11th grade, where things were sure to start moving even faster. My mom reasoned that I would do well to build a strong foundation in science knowledge before I had to face the major league fastball of a science class in boarding school. It sounded OK to me. I was intuitively attracted to anything that resembled the stopping of time. I regretted the decision on the first day, when Mr. Brukhardt started taking role. My name was near the end of the alphabet. By then my stomach had started to hurt. Throughout elementary school, I had been a promising student, a kid with potential. A Prospect. Maybe even a Future Star. But as Mr. Brukhardt looked up at me, baffled, I felt the last of that promise crumble. I felt big and clumsy, a dunderhead. Halfway through the semester I was reminded again of my status as a repeater when we started a class-wide investigation of a hypothetical problem involving a pond where all the fish were dying. We’d done the investigation the year before. It was one of the few things I’d enjoyed about the class. A mystery! Mr. Brukhardt had the presence of mind to pause in his introduction of the project. He looked at me. I sat in the back with a couple of my academically mediocre 10th-grade buddies. At the end of the year I’d get drunk for the first time with them, guzzling rum and coke in the little league dugouts. It’s not a good feeling, knowing the answer. You’d think it might be but it isn’t. You are currently browsing the archives for the Mark Corey category.